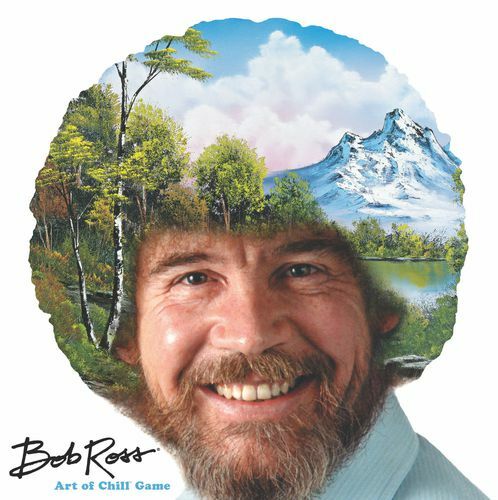 If you want to paint with Bob Ross, you need to be chill, so whoever reaches maximum chill first in Bob Ross: Art of Chill Game wins. In the game, each player starts with three art supplies cards, with each card showing one of seven paints and one of four tools. (Some cards are jokers that serve as any color, but no tool.) Take one of the large double-sided painting cards, place it on the easel, and place Bob on the first space on the painting track. On a turn, the active player rolls the die and either draws an art supplies card, plays a paint to their palette, receives an extra action for the turn (four total), or both draws a "Chill" card and advances Bob on the painting track. Chill cards give all players a bonus, set up conditions that could give players extra points, and more. The player then takes three actions. Actions include drawing an art supplies cards, discarding two matching cards to claim the matching technique card (which is worth 2 points and 1 bonus point when used), sweep the art supplies card row, place a paint on their palette, wash half their palette, or complete a section of a painting. To take this latter action, the player needs to have all of the paint needed for one of the painting's three sections on their palette with no unneeded colors mixed in! The player scores points equal to the number of paints used, bonus points if they're the first or second to paint this, and additional points if they've painted this feature before Bob (i.e., did you paint this before the Bob figure reaches this space on the painting track. When someone has completed all three features on a painting or Bob has reached the end of the painting track, this work is complete! Remove it from the easel, and start a new painting. Players continue to take turns until someone reaches a maximum chill of 30 points, at which point they win the game instantly.